Place large, deep skillet over medium heat and coat with EVOO. Add onion and garlic and cook about 5 minutes until translucent and soft. 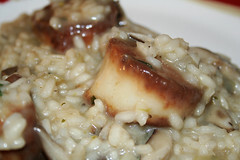 Toss in mushrooms and herbs and cook about 10 minutes until mushrooms are lightly browned. Season with salt and pepper. Add rice and stir to coat. Season again. Add wine and cook about 1 minute until alcohol has evaporated. Gently stir in scallops. Fold in butter and cheese and drizzle a bit more EVOO on top. Serve hot with a garnish of parsley.